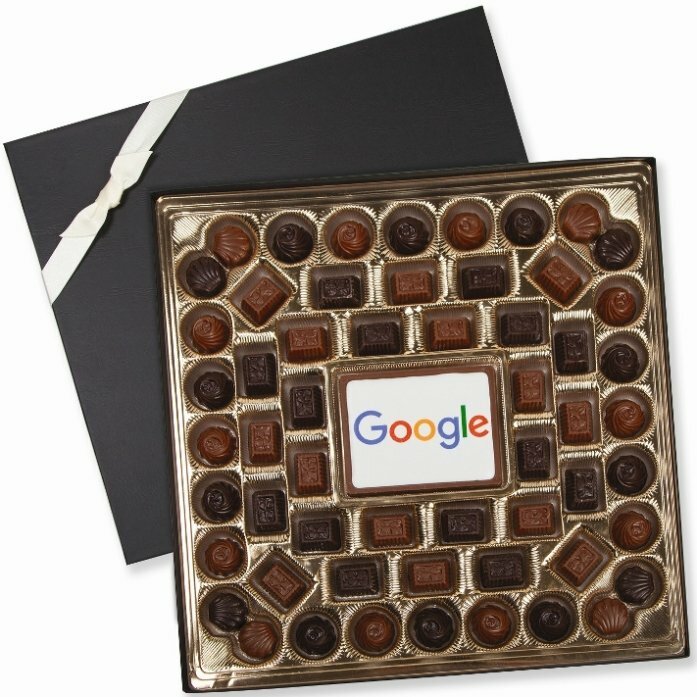 Chocolate Gifts-Custom Printed Delights-22 oz. Customize your logo on 22 oz. Printed Chocolate Delights for promotional chocolate gifts. Applications are holiday appreciation gift or everyday marketing for satisfied customers. 4CP printed with your logo and a choice of two stock themed designs to frame it. Completing the chocolate delight presentation is a border of shells and swirls. Overall size of the delights chocolate box is 14 3/4 wide x 14 3/4 high. This chocolate gift is Kosher certified, always made fresh daily. Why wait till the last minute for your holiday business gifts? Advance orders accepted for First Week Dec. delivery. This chocolate is Made in the USA. Price includes an Edible Ink 4CP print on chocolate bar area 3 7/8" w x 2 7/8" h.
Factory setup charge is $99.00. Reorders incur a $30.00 reset-up. Logo requires Illustrator ai, eps or pdf multi color art file.